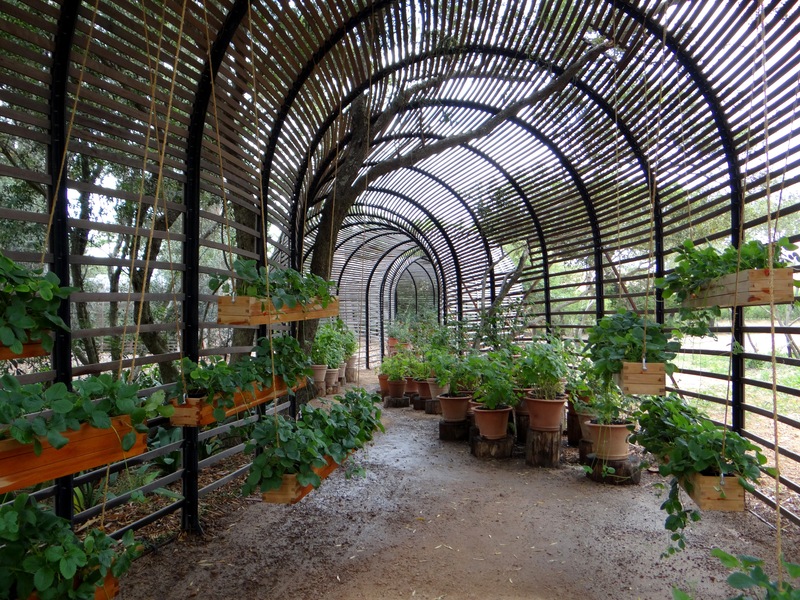 A perfect summers day is spending a couple of hours walking through the extensive gardens or Babylonstoren and ending it with a delicious winetasting session or with lunch at the Babylonstoren glasshouse. Babylonstoren is a Cape Dutch farm in the Western Cape with vineyards and orchards surrounded by the beautiful mountains of the Drakenstein Valley. 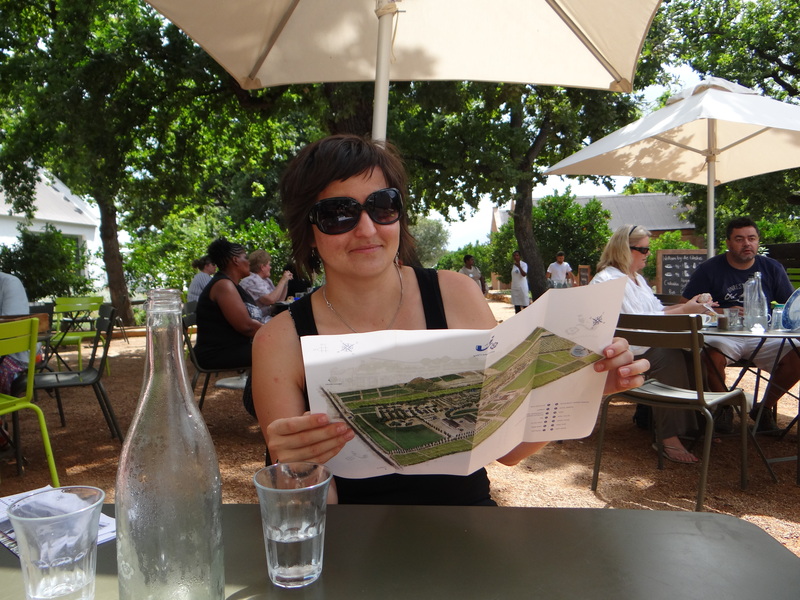 The Babylonstoren garden is at the heart of this wine farm. It was inspired by the Company Gardens of the Cape, where for centuries ships would replenish with sweet water, vegetables and fruit at the halfway station between Europe and Asia. This formal garden spanning eight acres has numerous things that make it a unique and enchanting place to explore. Every one of over 300 varieties of plants in the garden is edible and it is grown as biologically as they can. A huge variety of fruit, vegetables and herbs grow in formal beds, bordered by fruit trees and intersected by walkways, each of which has a distinctive character. (In the soft stone fruit orchard the paths are paved with peach pips.) 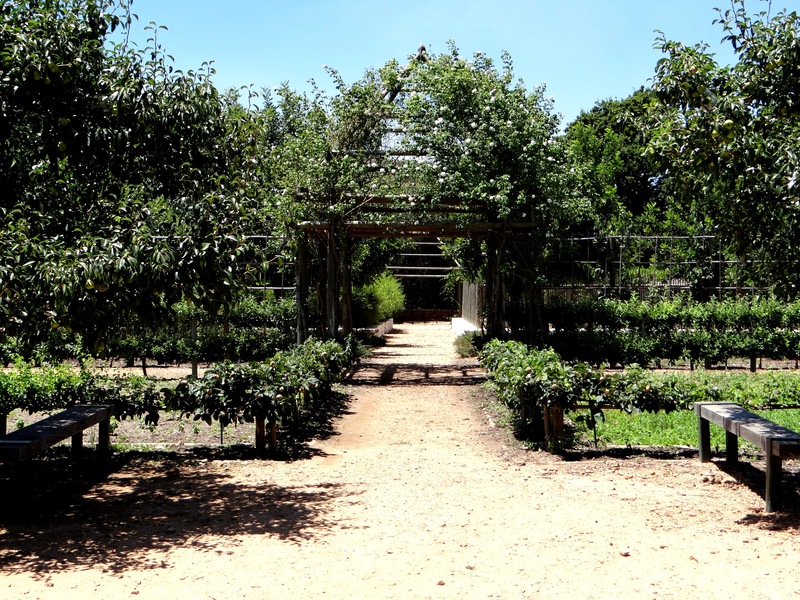 The garden is divided into fifteen clusters spanning vegetable areas, berries, bees, indigenous plants and even includes a prickly pear maze. They actually harvest the fruit and vegetable year round for use in the farm restaurant. 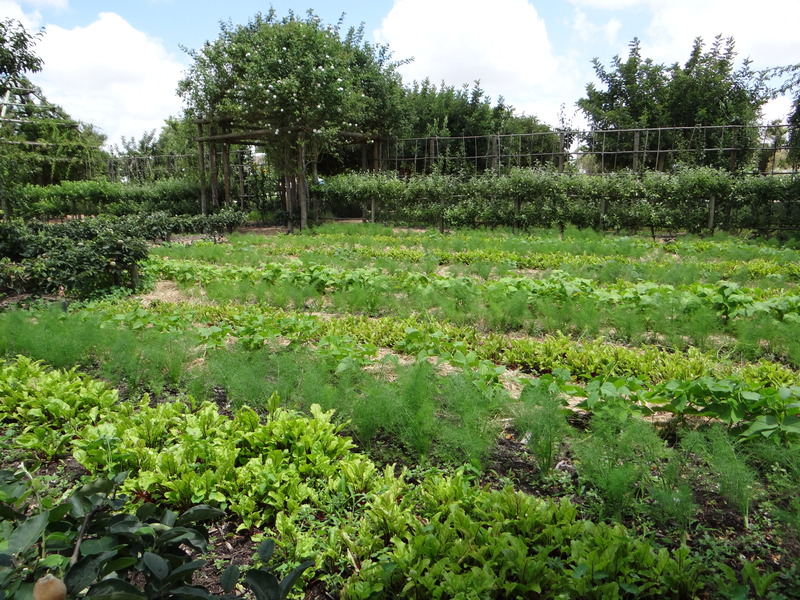 You can go and pick your own salad and then enjoy a meal in the Babylonstoren restaurant. We had the most delicious fresh fruit juice at the Babylon glass house halfway through our garden walk. Me standing in the middle of the vegetable garden! I loved the little hidden aspects of the garden like the meditation space and it has fragrant herb lawns for you to walk barefoot across. There are bee hives, not only to produce honey, but also to get the bees to pollinate the flowers. This garden has a very calming aspect on the senses. They draw water from the Berg River 10 km away via gravity, using flood irrigation for the citrus trees as it has been done for 300 years, for example, as one would in Spain and in the Middle East. specifically for a collection of the famous indigenous lilies of the region known as ‘clivias’, which flower during spring in September. It is constructed from an army of balau slats on steel frames, swelling and constricting just like its namesake, slithering through wild olive and eucalyptus trees. This ‘puff adder’ eliminates about 40% of sunlight but allows a free flow of air creating ideal conditions for clivias to thrive in. Apart from nourishment, the garden is also aesthetically pleasing, with 49 rose pillars, big timber structures with climbing roses, providing shade. As you wander around you smell indigenous herb gardens as well the blossoms and flowers from whatever may be in bloom at that time in the season. are you allowed to sample the fruits as your walk around? Thank you!! I actually dont know if you are allowed as they harvest the food for the restaurant on the farm. I will definitely have to find out next time. Your description, nourishing and aesthetically pleasing is perfect I really would love to visit these gardens. The photo of you at the wine sampling is so warm and friendly. It is a pose that always makes me feel I am going to get a big hug. Your blog has that joyous feeling to if that I so enjoy. I am sure she will be visiting you soon. Thanks Jack, that is such a beautiful compliment! Your gravatar is delightful, a smiling invitation you deserve the parse. What an awesome garden. I love the puff adder walkway. The inside is so beautiful, any garden lovers dream. I love visiting these gardens with you! Was that a Mulberry? Thank you and yes, I was so tempted to npick and taste them. Thanks! Hope you do get to explore it soon! It is, I have been back twice now and still havent seen the whole place. Thanks Steven. I hope you do make it down to South Africa, it is such an amazing place to explore. Especially the beautiful Western cape area. A huge thank you Pat!!! One of the most beautiful wine farms I have explored so far. Looks beautiful. And fun 🙂 I love the meditation space. It is so peaceful Madhu! I think I have to create something like that in my garden someday. I am jealous from this post – it seems we both enjoy the same places – Bravo! Thank you! I love exploring the outdoors and the Western Cape has so many beautiful places that its hard to choose where to next. I have not heard of this place – is it new? I’d love to visit so thank you for the virtual tour. And ending with a wine tasting sounds good to me! I dont think so, I think it has been here for a while, maybe they just changed things a bit. It is an amazing place to spend the day, and yes I would recommend the wine tasting as a perfect ending!. fun post and love the opening photo – such joy!! It is! I have to go back again as I didn’t even get to see everything. I would love to take one of the Garden tours next time!